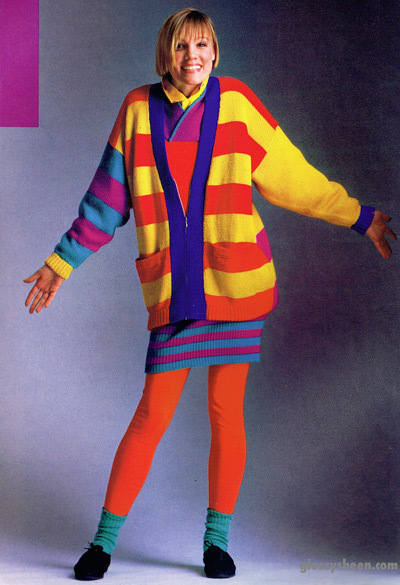 Giant sweaters, blindingly bright colors, stripes and polka dots all come to mind when I think of the essentially 80s clothing brand Esprit. 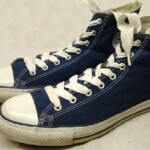 I vividly remember a sleeveless, crisp white and navy Esprit sailor dress that I was in love with and wore to death. 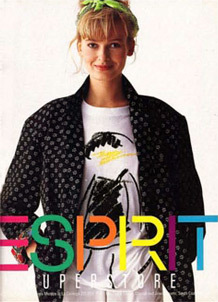 Unlike other iconic 80s brands like Ocean Pacific, Member’s Only and Guess, Esprit felt a little more special, a little more exclusive. I remember the Esprit store where I lived in Florida was at a fancy outdoor shopping center that had water features, restaurants and a movie theatre. If you couldn’t afford to outfit yourself in head to toe layered t-shirts, sweaters and leggings you at least had to have a sweatshirt with the logo emblazoned across the front, right? 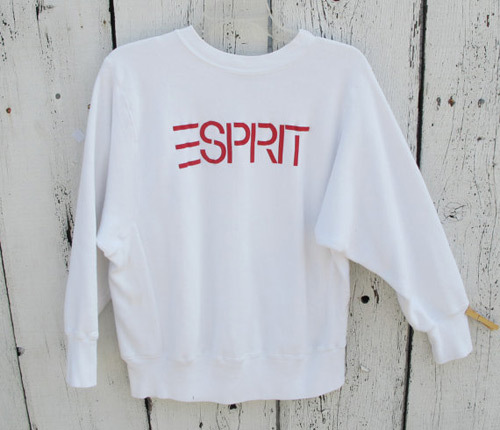 It all felt very European – I always assumed the brand was French but it originated in San Francisco – the introduction of Esprit’s ads called the “Real People Campaign” was plastered throughout the pages of my Sassy and Seventeen Magazines. Everyone looks so happy! And bright! 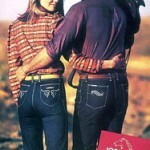 And check out how friggin’ forgiving this clothing line was! 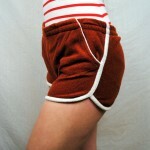 Good God, you could fit like four of those models in those pants/skirts/blazers. 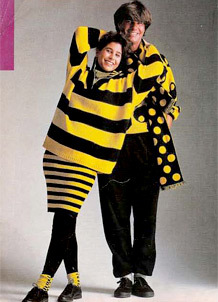 And what about the matchy-matchy bumble bee couple? LOVE THEM! 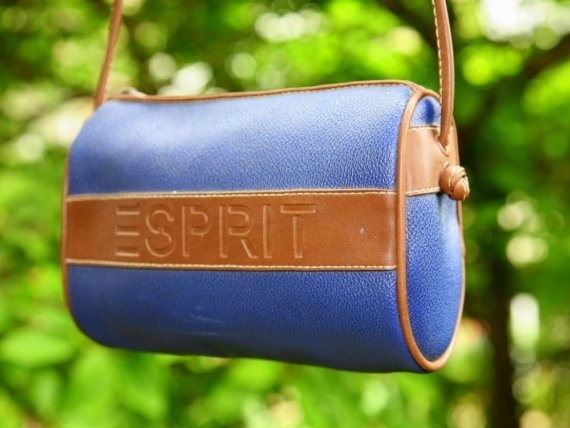 Only the very fortunate among us could afford the likes of the purse shown above with “ESPRIT” stamped into the leather band. We could dream. We could dream. 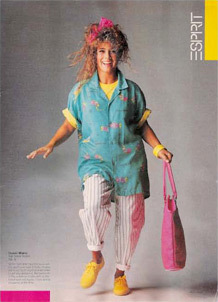 After last week’s Halloween candy binge, today I sure could use a really cute/colorful, potato sack dress to make me feel better about myself. 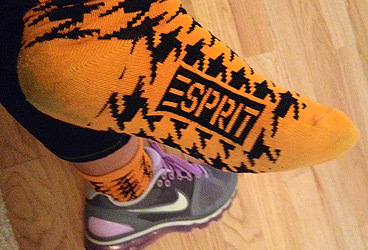 But I’ll have to settle for black and orange socks with a hole in the big toe, purchased at a fancy mall circa 1986. 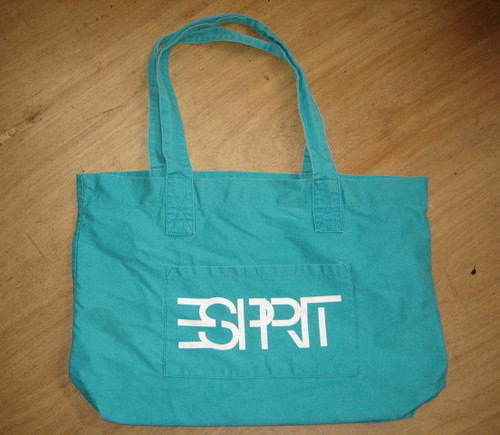 I loved Esprit and I had that purse. Reminds me of my childhood. Remember the Esprit color coded labels? 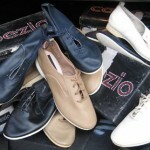 Loved those! Any items with the same colors went together.